Carefree Getaways is located right here on Sunny St. John! We provide that extra personalized care to our guests. Our agents have been on-island for 30 years, and can give that personal, detailed information about each villa, call us and chat about your vacation! For nearly three decades, we offer you a delightful variety of St John USVI vacation Villas, Private homes, Cottages and Condos on the most popular island in the US Virgin Islands, with vacation rentals suitable for every size, budget and occasion. You will find our St. John villa rentals are some of the most beautiful and varied in the USVI. Browse our villas to find the your perfect St John Vacation Rental, or call us and we'll make recommendations to help you decide which one is best for your next memorable St. John vacation! From your initial call or e-mail, host Cindy Ward will help you choose the St. John villa best suited to your needs. Reserve PRIVATE TAXI SERVICE to take you from the St. Thomas airport to the Ferry Dock in Red Hook. Cindy or one of our friendly staff will GREET YOU AT THE ST. JOHN FERRY DOCK, take you to your rental car agency and lead you to your St. John villa. WE ARE ON CALL DURING BUSINESS HOURS FOR ADVICE on where to dine, swim, snorkel, hike, rent kayaks, powerboats, windsurfers, etc. REFER YOU TO: WEDDING COORDINATORS, CATERING SERVICES, DIVE COMPANIES, DAY SAILS AND CHARTER BOAT EXCURSIONS. 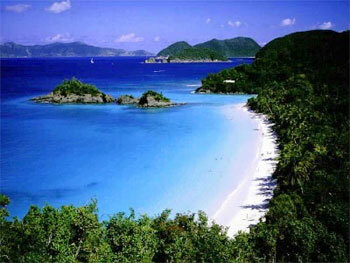 Carefree Getaways on St. John welcomes you to our lovely island of St. John in the United States Virgin Islands. Enjoy the Caribbean Tropics from a US Territory. St. John villa rentals are some of the most beautiful and varied in the Caribbean. Our St. John villas are located on an island which is two thirds National Park and therefore pristine and uncrowded. All of our St. John villa rentals have sparkling sea views, most have A/C in the bedrooms, a pool and/or spa. All of our St. John villa rentals are privately owned and fully equipped for your vacation relaxation and pleasure. Each St. John villa provides linens, paper products, cookware, microwave and the usual kitchen appliances; ceiling fans, telephones with answering machines, irons and ironing boards, gas or charcoal grills, coolers, beach towels and chairs, cable TV, VCR or DVDs and CD stereo systems. With few exceptions, each St. John villa rental offers washer/dryers and dishwashers, as well. **Please note: Any gatherings larger than the number of guests confirmed and paying for their stay at our villas are subject to Carefree Getaways and the home owner's approval. Additional fees will apply if the gathering is approved. Please inquire for further details.